In recent years, business leaders, policymakers, and inventors have complained to the media and to Congress that todays patent system stifles innovation instead of fostering it. But like the infamous patent on the peanut butter and jelly sandwich, much of the cited evidence about the patent system is pure anecdote--making realistic policy formation difficult. Is the patent system fundamentally broken, or can it be fixed with a few modest reforms? Moving beyond rhetoric, Patent Failure provides the first authoritative and comprehensive look at the economic performance of patents in forty years. James Bessen and Michael Meurer ask whether patents work well as property rights, and, if not, what institutional and legal reforms are necessary to make the patent system more effective.Patent Failure presents a wide range of empirical evidence from history, law, and economics. The books findings are stark and conclusive. While patents do provide incentives to invest in research, development, and commercialization, for most businesses today, patents fail to provide predictable property rights. Instead, they produce costly disputes and excessive litigation that outweigh positive incentives. Only in some sectors, such as the pharmaceutical industry, do patents act as advertised, with their benefits outweighing the related costs. 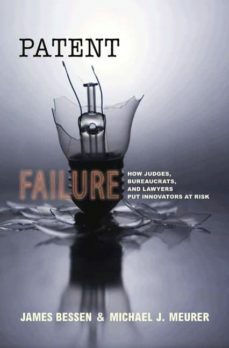 By showing how the patent system has fallen short in providing predictable legal boundaries, Patent Failure serves as a call for change in institutions and laws. There are no simple solutions, but Bessen and Meurers reform proposals need to be heard. The health and competitiveness of the nations economy depend on it.